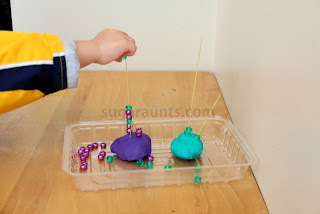 This fine motor pincer grasp activity uses colored beads to work on fine motor skills while kids color match beads to play dough. 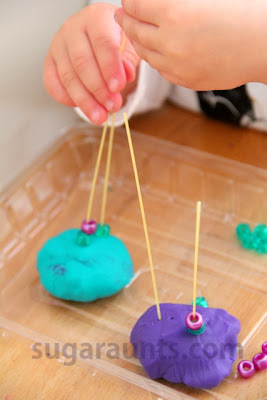 When threading beads onto dry pasta (or skewers, toothpicks, or other "sticks") stuck into play dough, children improve various skills necessary for pencil grasp and functional grasp. 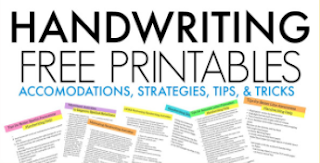 Use this simple fine motor activity to improve visual motor skills, pincer grasp, in-hand manipulation, separation of the sides of the hand, and more. 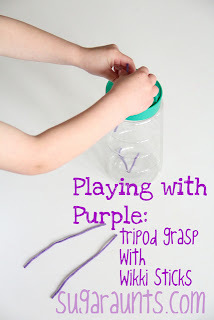 This was a fun play time activity for the little ones in our house. 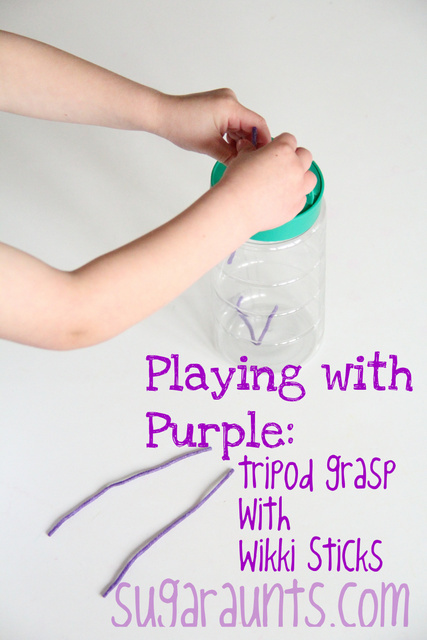 We had fun with fine motor play while working on colors, matching, and fine motor skills. 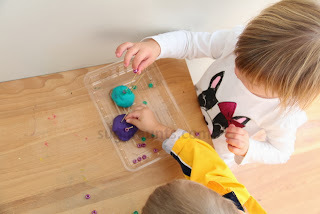 Play dough is such a great learning tool. 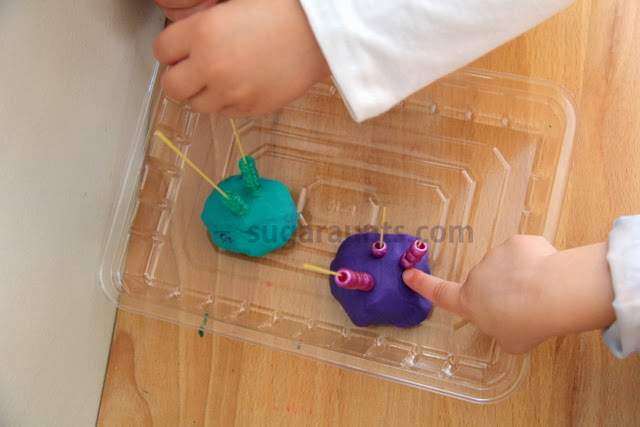 The kids always love when play dough is pulled out. This one took two colors and some spaghetti noodles. 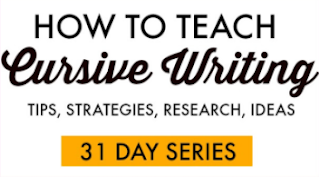 We've seen lots of examples of this type of activity around the web, and love the inspiration from Mess For Less. 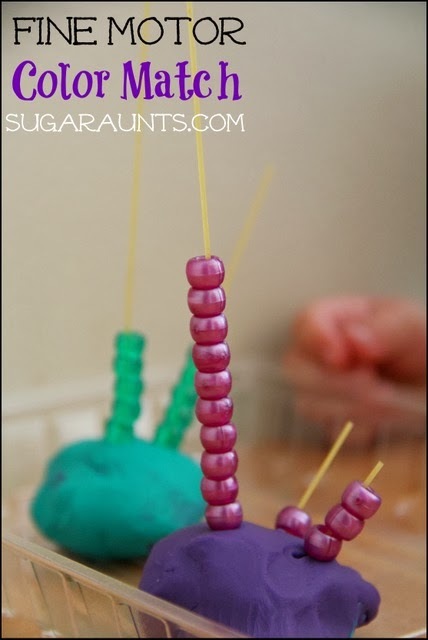 Instead of stacking cereal on our spaghetti noodles, we went with colored beads and two colors of play dough. 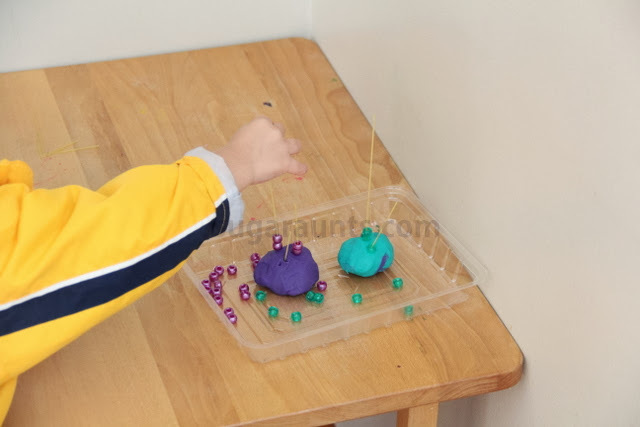 I put two colors of play dough on a plastic tray and stuck some dry spaghetti noodles into the dough. Scatter some beads around and we are ready to play! I put a few beads onto the same-colored dough to show an example of matching the colors. Baby Girl and Little Nephew (both newly 2 years old) LOVED this! They really astonished me that they could match the colored beads right away to the correct dough. 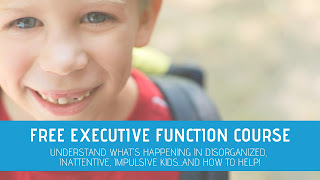 They really got into this activity. There were hands everywhere for a while, reaching for beads and noodles! 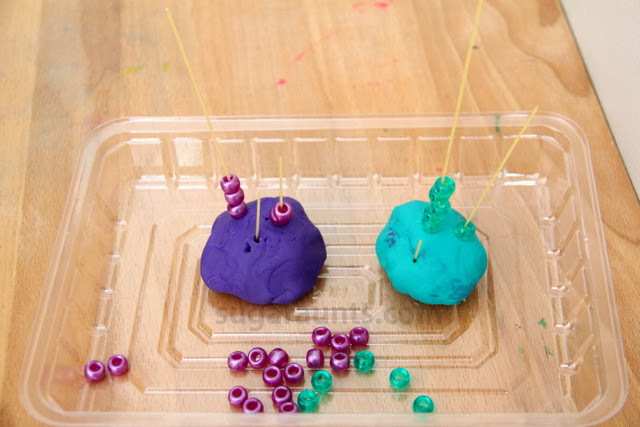 Have you done a version of the noodles in play dough activity? We'll be doing this again for sure with all the fun we had!